Both Brandon and I have talked a lot about Warhammer 40k. It isn’t just the game itself, or the models, we’re pretty taken with the setting itself. 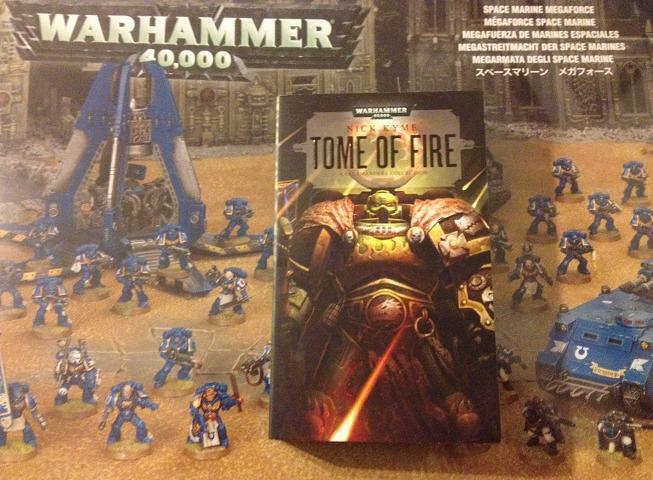 Luckily Games Workshop’s publishing arm is a machine that produces new material at a pretty astonishing rate. 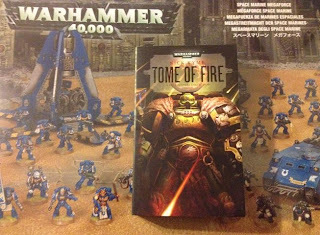 I’ve been pretty adamant in my love for the Salamander Space Marine chapter, so it shouldn’t surprise anyone that I thrilled to pick up Nick Kyme’s newest Salamander novel, Tome of Fire. Tome of Fire is interesting because it really is an anthology that supports the Tome of Fire trilogy. The trilogy completed last November when Nocturne was released. During the time Nick was writing the trilogy he was also writing other short stories about the Salamanders. They were for fliers, other anthologies, and Black Library events. Tome of Fire collects all of those short stories and arranges them chronologically. The index at the front of the book points out exactly where the three novels fit into the reading order. I’ve already read a handful of the stories published in Tome of Fire. The longest of the stories was a free pdf download on Black Library’s website for years. I’m excited to get to the stories that I haven’t read yet. I may just have to use the anthology as a guide and reread the entire series.